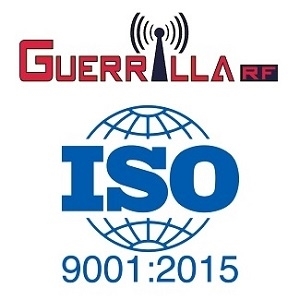 Guerrilla RF, a provider of Monolithic Microwave Integrated Circuits (MMIC), has been awarded ISO9001:2015 certification status by TUV Rheinland of North America, a 3rd party registrar. As part of the ISO certification process, Guerrilla RF underwent a rigorous audit of its business and management processes, including the design, operations and sales processes. This achievement is another step and further confirms Guerrilla RF as a major supplier in the design and sale of high performance Radio Frequency Integrated Circuits (RFIC's) and Monolithic Microwave Integrated Circuits (MMIC's) for consumer, commercial and military wireless product applications. The ISO9001:2015 Certification is a tried and tested framework for taking a systematic approach to managing an organization's processes to enable consistent delivery of product that satisfies customer expectations. It is used in 190+ countries by businesses organizations, in public and private sectors, by manufacturers and service providers. ISO 9001:2015 replaces the prior ISO 9001:2008 certification standard.